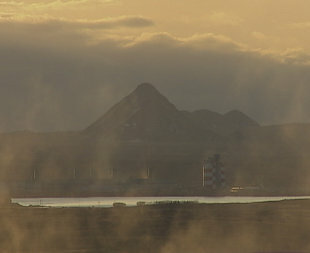 HAFNAFJORDUR – Saving Iceland has closed access to RioTinto’s Straumsvik smelter in South-West Iceland. About 20 protestors have locked their arms in metal tubes and climbed onto cranes on the smelter site. Saving Iceland opposes plans for a new RioTinto-Alcan smelter in Keilisnes or Thorlakshöfn, expansion of the existing smelter, and a new coal and nuclear powered smelter in South Africa. “Protests against Alcan have been successful. Of course the people of Hafnafjordur have stopped the expansion of Straumsvik and recently, in Kaskipur, Northeast India, Alcan had to give up it’s participation in a bauxite mine because of protests against their human rights violations and environmental devestation. Alcan has been accused of cultural genocide in Kashipur, 1 because mining and dams have already displaced 150.000 mainly tribal people there 2. Norsk Hydro left the project when police tortured and opened fire on protestors, and then Alcan moved in,” says Saving Iceland’s Jaap Krater. ALCAN and Mayor decide: To Hell with Democracy in Hafnarfjördur! The National Theatre Adorned with Iceland’s New Flag. The National Theatre is adorned with Iceland’s new flag. President of Iceland in waiting? Update: ALCAN prefered murderous Rio Tinto. So now its ALCAN – Rio Tinto. Nice addition to the corporate criminals that the Icelandic government like to wag their tails to. This indicates the true nature of Icelandic politics. Alcoa have announced plans to take over Canadian aluminium company Alcan, both companies own infamous smelters in Iceland: Alcoa in Reydarfjördur, Eastfjords, and Alcan in Hafnarfjördur, near Reykjavík. An informal takeover offer amounts to nearly USD 33 billion (EUR 24 billion). Bank of America recently upgraded its estimation of Alcan’s shares from USD 62 (EUR 46) to USD 82 (EUR 61) per share. Financial experts believe other aluminium companies may want to invest in Alcan as well. Alcoa and Alcan have discussed cooperation for nearly two years, which has not been successful, thus Alcoa is planning a takeover. According to information from Alcan in Iceland, the news about the takeover came as a surprise. There have been persistent rumours that Rio Tinto is planning a hostile takeover of Alcoa. Does the Black Dog haunt ALCAN after referendum defeat? A strange seal was spotted on the shore by Straumur near the ALCAN aluminium smelter. Its front flippers were deformed, so they looked more like dog feet. “I have turned sixty and I thought I knew a thing or two about animals, but I never knew seals could have feet,” eyewitness Gunnar Örn Gudmundsson told Fréttabladid. “I could hardly believe it when I took its picture. They looked like feet on a Labrador dog” Gudmundsson said, adding he believed the seal had been very tired and was resting on the shore. “I was only about one meter away when it started hissing at me, it was probably completely exhausted,” Gudmundsson explained. Is it surprising that the poor animal would be feeling a lot less than well and normal after having to swim in the polluted waters of a 240.000 tonnes aluminium smelter? Celebration as Hafnarfjörður Rejects Alcan Expansion!